On June 28th, 1994, ORBIS International received FAA STC approval for the conversion of a DC-10 aircraft into an Ophthalmological Teaching Hospital. Avionics Engineering Services of Tucson, Arizona and Schwartz Engineering Company of San Antonio, Texas provided the necessary engineering and FAA certification services for the effort. The award of the STC approval was the culmination of two years of effort that included countless hours of work and millions of dollars of donations by many dedicated professionals and supporters. In addition to providing state-of-the-art eye surgery, the new aircraft provides a 48 seat classroom. Live video from the operating room may be viewed in the on board classroom or in remote classrooms. A state-of-the-art audio/visual suite provides the ability to produce studio quality, audio/video training tapes of the onboard surgery while at any location in the world. The aircraft is totally self-sufficient while parked on an airport ramp thanks to externally deployable, diesel power generation modules and air-conditioning modules carried in the existing cargo compartments. 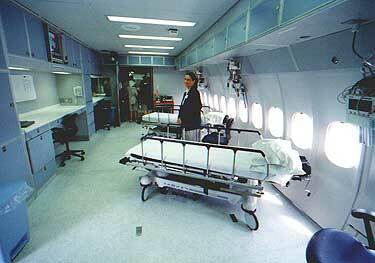 The ORBIS International Flying Hospital is currently serving the blind and visually impaired of the world. Avionics Engineering Services provided the engineering design, analysis, and testing of all the added electrical systems, including a unique 60 HZ power system. Electrical systems were implemented in the laser exam, operating, semi-sterile, recovery, classroom, communication, and conference rooms. All modifications were performed at Mobile Aerospace Engineering in Mobil, Alabama. 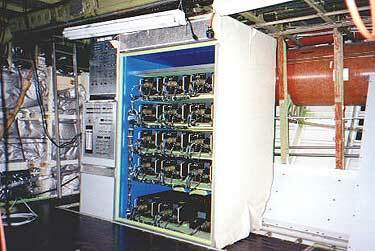 Aerovation mounted a module containing fourteen 60 HZ converters in a cargo size removable container, located in the aircraft’s lower galley area. The installed module also houses a battery system to run a refrigerator. Additionally, it contains a 1KVA converter that powers the water purification system and entertainment system. The 60 HZ converters provide power to the entire hospital and systems. 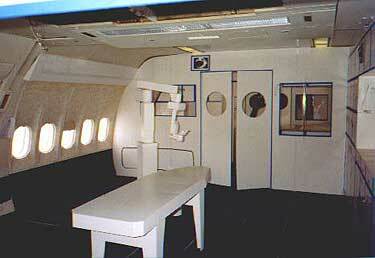 Prior to work commencing on the aircraft, a foam board mock-up of every room was constructed. 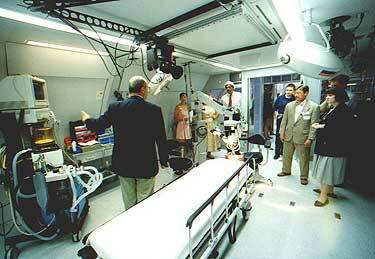 Shown here is the operating room. After the room mock-ups were approved, they were removed and the aircraft was stripped down to the bare bones for maintenance and new structures installation. In this room the medical staff starts their examination of the patient and determines the type of corrective eye surgery required per patient. Three types of lasers are available for procedures of varying intensity. Here the medical team discusses surgical procedures among themselves or with patients. 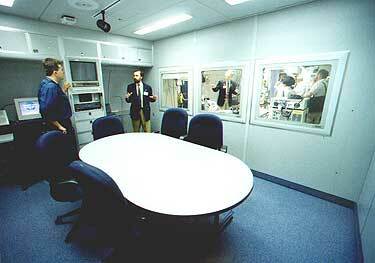 Personnel may monitor operations through windows overlooking the operating room. Viewing is also available on the 22 inch monitor found in each room on the aircraft. 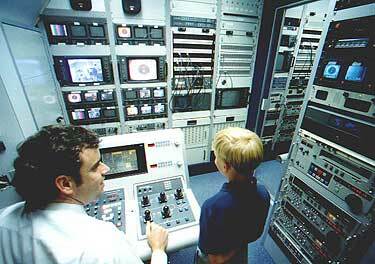 With the audio/video suite on board, technicians may produce and edit studio-quality tapes of new ophthalmological surgical techniques. These tapes can be produced on VHS, Beta, or Laserdisk format. Tapes of surgeries are left with the doctors in the visited country for further viewing once ORBIS has departed. The operating room equipment and space is equivalent to that in a major hospital. 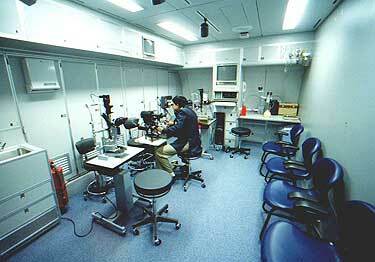 A camera microscope is used during surgery to provide the classroom an in-depth “surgeon’s eye view”. The equipment in this room is the highest quality available.